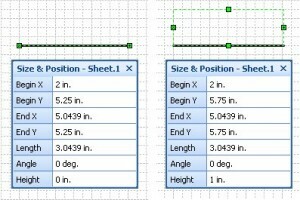 Visio shapes can be either 1D (one dimensional) or 2D (two dimensional). Unfortunately, there is no 3D shape although you can produce a “3D-like” 2D drawing by using the same methods as you would on paper… isometric, axonometric, perspective, etc. Most Visio drawings that simulate 3D are drawn as isometrics… but I digress and will cover that in a future post. Is Visio a sensible alternative to CAD systems? Why are my Visio files so large?